The Trix 0-6-0 would appear to be based on the Pennsylvania Railroad's Class B8, which is unique to the PRR owing to its Belpaire firebox; hence, this specific locomotive would not be seen on other railroads (not that it mattered much to model manufacturers). Also, since it's technically a switcher, it would only be seen in railroad yards and around shops. Since these locomotives were made for decades, later-vintage models are sometimes passed off as Postage Stamp. There are two telltale signs that a loco isn't legit: one, a road name and/or number other than those shown above; and two, a very subtle little manufacturing difference: the eccentric crank was changed from a two-part assembly (right, top) to a one-piece casting (right, bottom). The motor was changed as well, although this would be difficult to determine without removing the shell. Also be aware that the bell mounted atop the firebox is so easily broken off that it can be difficult to find a used loco that still has one. 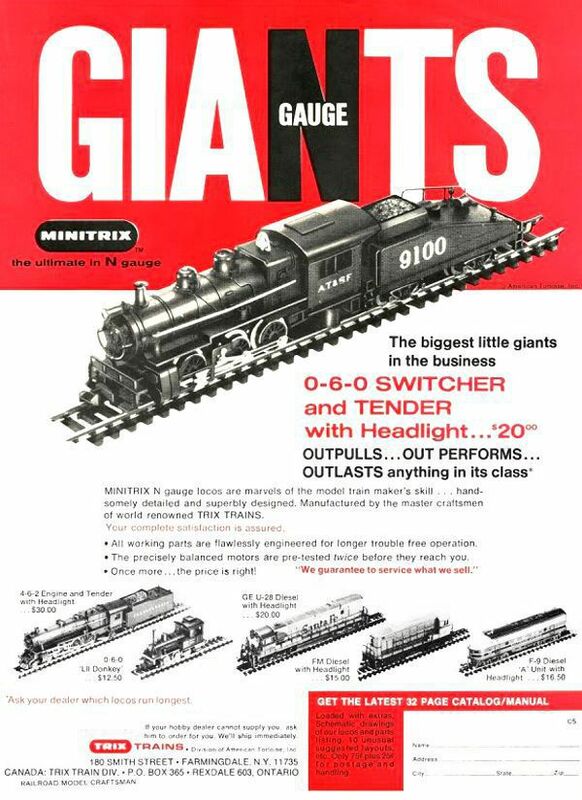 Incidentally, it appears as though the 0-6-0 in Aurora's 1968 catalog (below) may have been a pre-production model, since it differs from the ones that came in sets and were sold individually. The side rods and valve gear are quite different, as is the lettering—it looks like the one in the catalog was decaled. The box marked 4862/420 is very likely a typo, meant to be 240 (420 is the road code for Celanese Chemicals).